Mike Leigh’s “Peterloo” is English down to its DNA (more about that below), but there is no avoiding the sideways lancing it gives the boil of current U.S. politics. Leigh often addresses issues of poverty, class and malignant ignorance in the contemporary United Kingdom, but this time he is aiming his well-sharpened spade at the roots of the economic inequality that plague both our countries: Not just a contempt for the working classes by the ruling elite, but a sense of divine rightness—a God-given entitlement to more and more, by a relative few. What he is digging at, under a remarkably convincing recreation of 1819 England and the nascent reform movement of early 19th-century Britain, is both the brutality and the self-righteousness exhibited by the haves, when the have-nots ask for more. “Peterloo”—the ironic tag given to a disaster that occurred just four years after the “glorious victory” at Waterloo, and immortalized in Percy Bysshe Shelley’s Mask of Anarchy—is Leigh’s most ambitious production, including as it does a cast of thousands, not counting any C.G.I. cloning that might have augmented the scenes of the actual political rally/massacre. There, saber-wielding British military on horseback drove into a crowd now estimated at having been between 60,000 to 80,000, killing a relative few but wounding hundreds. In “Peterloo,” language is a mechanism by which equality is made evident. The film’s recreation of a moment in British history equals that of Leigh’s art biopic, “Mr. Turner,” or “Topsy-Turvy,” his backstage masterpiece about Gilbert & Sullivan. And it should probably be considered something of an architectural marvel, given that it was constructed via Leigh’s usual M.O., a collaborative effort between the director and his actors, involving extensive rehearsals and the development of a script through improvisation. How some of the film’s more elevated and even florid oratory came to be—and that it became such a key element in the film—is nothing short of a wonder. “Peterloo” begins, quite appropriately, with a single individual, an army bugler named Joseph (David Moorst) who stumbles off the blasted field at Waterloo and somehow makes his way home to Manchester, clearly unhinged by what he has seen and suffering from an ailment that would not be recognized for about 160 years—P.T.S.D. He reaches home to find his family relatively content, the men employed in the textile mills, the women amicably bartering at the local market. They are happy to see him home; it has obviously been years; he is introduced to an infant niece he has never met. In a moment, the infant is 4 years old, the mood at the market is dark, the demented Joseph is still in uniform, asking for work from tradesmen he has probably asked 100 times. The other Manchester men, worn and reduced, are debating what can be done and what to do. The infamous Corn Laws, which were enacted to protect growers and forced the poor to buy only high-priced English grain, were exacerbating conditions wrought by cuts in mill salaries. There was no suffrage for average citizens in places like Manchester. Only propertied men could vote and such phenomena as “rotten” or “closed” boroughs, which might be controlled by only one landed voter, kept power in the hands of the very few. And those few were intent on keeping that power. There is no shortage of eloquence, never mind intelligence, among the “seditious” elements in Manchester. As with any political uprising, there is an element of craziness, which Leigh portrays—for example, the radical element that envisioned England as an anarchist collective with the mad, despised King George III in prison. Most, though, are more reasonable, their oratorical skills making a MAGA rally sound like the braying in a barnyard. There are real people portrayed here—notably the radical reformer/orator Henry Hunt (Rory Kinnear), the local agitator Samuel Bamford (Neil Bell), the palsied Home Secretary, Lord Sidmouth (Karl Johnson) and among the magistrates responsible for setting Englishman on Englishman, the Rev. Charles Ethelston, given a venomous portrayal by Vincent Franklin. The arrogance and contempt of the “authorities” in “Peterloo” often border on the cartoonish, but never the implausible. There is a lot of talk in the film, too, perhaps too much, but Leigh has always recognized the political power of words. In his otherwise completely dissimilar drama “All or Nothing” (2002), one theme is the frustration of the young people in the story, who are rendered powerless by an inability to express themselves by virtually anything but vulgarity. In “Peterloo,” language is a mechanism by which equality is made evident—there is no shortage of eloquence, never mind intelligence, among the “seditious” elements in Manchester. If anything, the rhetoric of someone like Ethelston is ludicrously overblown. They are certainly members of the same tribe, which Leigh has made obvious in his casting. None of the usual names appear in this Mike Leigh film. No Jim Broadbent or Lesley Manville or Timothy Spall or Ruth Sheen. No familiar faces to distract from the place or time. Everyone in “Peterloo” looks like he or she might have actually existed in 1819 and arisen from the same relatively shallow gene pool. The various characters are also afflicted with this ailment or that, a twitch here, a dash of madness there. David Thewlis (Mike Leigh’s “Naked”) might have fit in, if he were not so well known from “Harry Potter,” because he too has the look of an uninterrupted genetic link to the early 19th century. Political thinking, not celebrity, is one purpose of “Peterloo,” but so is the concept of a nation as family, something the monied interests of 1819 England laid to waste on a field in Manchester. And their legacy, Leigh would likely say, continues. 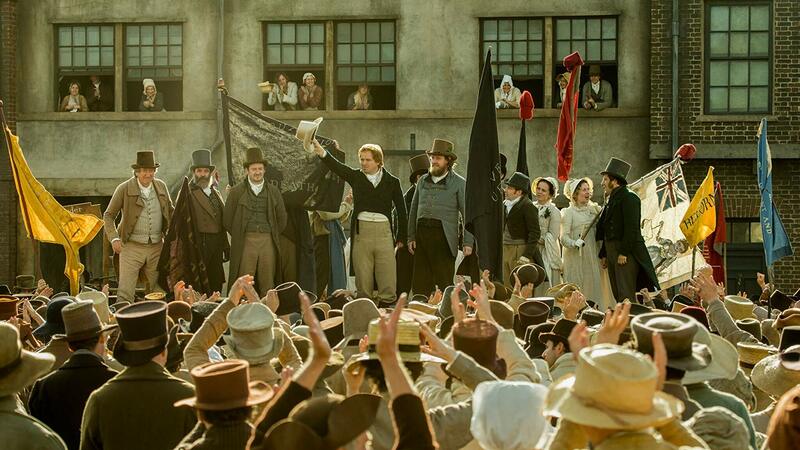 Peterloo is an amazing movie. I booked my tickets with Refer Discounts and save extra on my tickets.